Photo © Archive of the Tourist Board of the Province of Venice. So don’t let the crowds put you off. Sights on the well-beaten track may see you joining thousands of others. But it is possible to escape the crowds, especially after nightfall, when day-trippers have returned to the mainland or their cruise ship. For general visiting information, consult Venice’s official tourism office. The Venice Ghetto comprises several small, interconnected plazas. The Jews were originally confined to what is now called Campo del Ghetto Nuovo—a tiny island that had been the site of a foundry. The main square of the ghetto is home to the Jewish Museum of Venice, several 16th-century synagogues, a Holocaust memorial, a kosher hotel and restaurant as well as a Chabad House and yeshiva. A tour of the Jewish museum includes visits to at least three of the ornate synagogues. Notice the distinctive architecture—tall, multistoried buildings. Jews had to build upward to conserve space. Still, overcrowding in the Ghetto Nuovo forced expansion into what is now the Ghetto Vecchio in 1541 and, in 1633, into the Ghetto Nuovissimo. Today, fewer than 500 Jews live in Venice, and few of them live in the ghetto. But there are new Jewish-themed shops, galleries, eateries and other venues as well as a helpful Jewish tourist information center. Chabad Venice’s website also offers helpful resources for Jewish travelers. Basilica di San Marco (left) and the Palazzo Ducale. Photo © Archive of the Tourist Board of the Province of Venice. There’s no escaping crowds here. 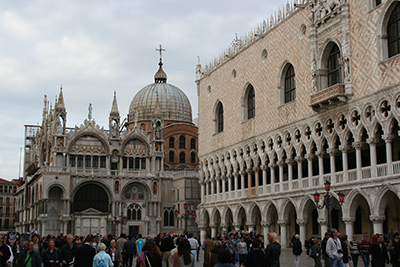 This enormous plaza is the institutional—and touristic—heart of historic Venice, replete with the most recognizable religious and secular architectural symbols of the city. At one end stands the glistening Basilica di San Marco (St. Mark’s Basilica), with its golden mosaics and multiple domes and arches. Originally built more than 1,000 years ago to house the tomb of St. Mark, it fuses Byzantine and Western styles and boasts sumptuous fittings and decoration that include a treasure-trove of priceless liturgical objects and sculpture. In front of its main façade, the basilica’s red-brick bell tower, or campanile, soars nearly 350 feet into the sky and is a favorite with tourists. Nearby are several important museums, including the archaeological museum and the Palazzo Ducale—the vast complex that served as the residence of the Venetian ruler, the Doge, as well as the administrative center of the Venetian government. Founded in 1386, the cemetery predates the ghetto and is one of the oldest surviving Jewish cemeteries in Europe. Located on the Lido—a long, thin island to the southeast of Venice proper—it is far from the tourist crowds and reachable from the ghetto via a 40-minute vaporetto ride. The cemetery is divided into two sections: the original part, dating back to the 14th century, and a newer section that boasts magnificent tombs from the 19th and 20th centuries. Contact the Jewish museum to arrange a visit. The Rialto bridge. Photo by Ofir Barnea. As a city of canals, Venice is also—by necessity—a city of bridges. There are hundreds of them, from simple brick or wooden steps to elaborate creations. 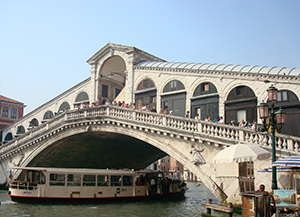 The most famous is the 16th-century Rialto Bridge, one of four bridges that cross the Grand Canal. Its wide, steep stairways are lined by shops, and there are convenient places to pause and look out at the marvelous views. The colorful Rialto Market is on the western side of the bridge. The Bridge of Sighs (Ponte dei Sospiri), built in the early-17th century, is an enclosed passageway high above a canal that links the Palazzo Ducale to the neighboring prison. Shaped like a sinuous backward “S,” the Grand Canal is the city’s main waterway, dividing Venice into two sections. 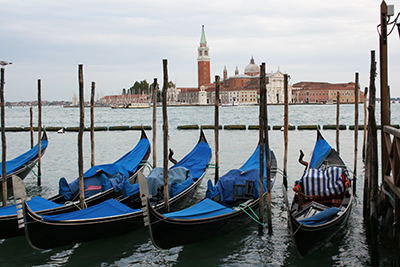 You can take a vaporetto the entire length of the Grand Canal, from the Santa Lucia train station to St. Mark’s Square. The trip takes about 40 minutes and is an affordable minicruise offering breathtaking views. The vaporettos can be very crowded, however, so it is best to take the trip very early in the morning, before rush hour. The Winged Lion is the symbol of St. Mark, and in turn a symbol of Venice. You will find them all over the city—no one knows for sure how many there are, and it’s become a fun game to look for them. The most famous is an ancient sculpture atop a column in the open space between San Marco and the Grand Canal waterfront. Photo courtesy of the Peggy Guggenheim Collection. Two of the foremost museums and galleries in Venice are located near each other on the Grand Canal and house sharply contrasting collections. The Gallerie dell’Accademia focuses on Italian art from the 14th to 19th centuries, with masterpieces by Renaissance artists. 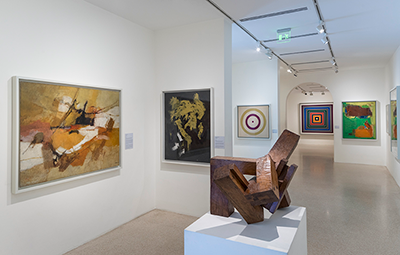 The Peggy Guggenheim Collection specializes in the 20th century and features stunning paintings, sculptures and other works by some of the greatest international names in modern art. Motor vehicles are forbidden in Venice, and one of the city’s greatest pleasures is simply the experience of wandering through its warren of pedestrians-only streets and lanes—some of them only a few feet wide. You may get lost, but don’t worry—you can generally get back on track by orienting yourself through the sometimes hand-painted signs pointing in the direction of major sights such as the train station, the Rialto and San Marco.